Posted February 1st, 2013 by Alison & filed under Advice, Ideas, Inspiration & Trends, Patios. A patio is often a central or focal part of the garden. A professionally designed patio can be a wonderful asset and provide a beautiful yet functional area from which to enjoy the surrounding area. As landscape designers (and hence, often, patio designers! 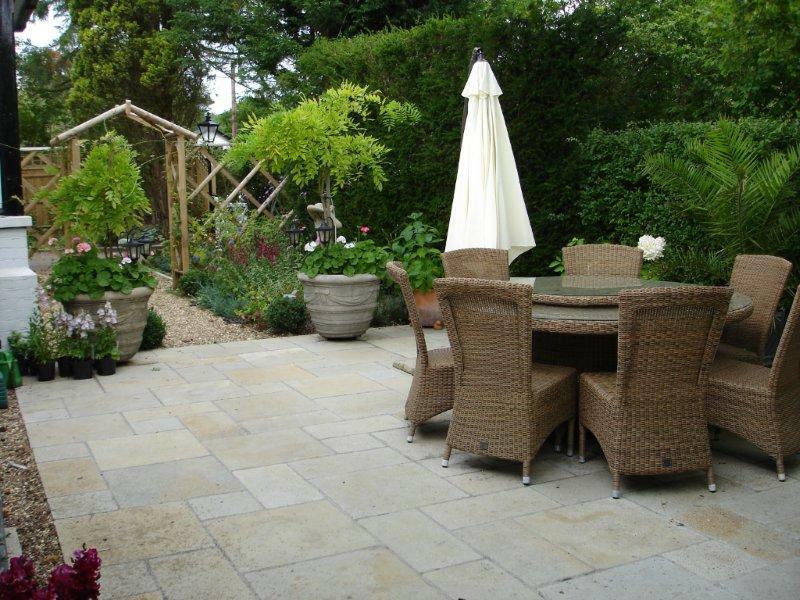 ), we frequently advise clients on some of the options and decisions to be made when creating a new patio. We have pulled together some of the key areas to consider here. All of the patios shown here have been designed and installed by ALDA’s in-house team. If you need help designing your patio, please call on 0118 934 2958. What is the new patio for? This may seem an obvious first consideration, but it’s one that often gets forgotten in the excitement of choosing materials and furniture! Is it to be just a cosy area for two people, a family eating and gathering space, or an ‘outdoor room’ for dinner parties and entertaining? The answer to this question should help dictate the size of the patio – it needs to be large enough! As a rule of thumb, 3m x 3m is a sensible size for a typical patio with a table big enough for 4 or maybe even 6 people. You can get away with smaller if there are less people, or if the furniture is dainty. You may also be able to keep the patio to a small size if you can overspill onto the lawn. For this reason, beware of completely enclosing the patio with borders or walls and raised beds. Does it have to go next to the house? The area adjoining the house is normally the most convenient place for a patio – it makes life a whole lot easier when it comes to transporting food and drink to and from the kitchen. It also saves you & your family/friends/guests traipsing across (possibly wet) grass. But give some thought as to whether this is your best option, or whether there is scope for locating the patio elsewhere. Often the area adjoining the house might not have the best aspect; remember a patio is usually somewhere for sitting/eating/socialising – so you want to be in the best position to sit back and relax in your surroundings! A well thought out patio design can always include a weather-proof way to access the patio which integrates seamlessly into the garden as a whole. Another consideration – is privacy an issue? If so, this will very much contribute to your decision on the position of the patio – you may decide to locate the patio away from the house for this reason. Or if that’s not possible, consider ways of making the patio more private – a trellis, pergola (see next section), and or course, plants. Our earlier article on screening plants and ideas for confined spaces might be of interest here. If you do decide to situate your patio adjoining the house, it’s often rather nice to have an additional, smaller patio and/or seating areas around the garden – the latter need only be large enough to house a chair or bench! Most of our clients like to have somewhere (west facing) to sit in the sun on a summer’s evening – be it for a meal or just a quiet drink at the end of the working day (the ‘gin and tonic seat’). You might also want somewhere to enjoy breakfast or a morning coffee. Including some form of pergola on or at the edge of the patio can be beneficial in terms of providing shade if the area is very sunny. It can also help provide privacy where necessary, and is a means of softening the area with planting at height. If you’re planning to dine al-fresco, a pergola is also an unobtrusive way to incorporate down-lighting – particularly important if you are planning to eat outside a lot. A word of caution – pergolas need careful planning to ensure that the posts are sited appropriately and don’t get in the way of your patio table and chairs. This is particularly important for small patio areas, as they can easily gobble up valuable space! Remember that if the patio is to be raised, there are safety issues to consider – you don’t want the embarrassment of having a friend falling off the edge of your patio and twisting their ankle when they leave the table at your al fresco dinner party!! Drainage requirements – particularly important if your patio is large, or your garden is prone to water logging. Lighting – As mentioned above, a pergola can be useful if down-lighting is desired. Alternatively, there are various forms of ground lighting that can work well in the absence of a pergola. If you anticipate eating outside a lot, investing in the installation of electric lighting is often a worthwhile one. Awnings – particularly important to consider if you do a lot of entertaining outside and want to ensure you can continue outside whatever the weather! What shape should your patio be? Many of our clients prefer soft flowing curves, and generous curvaceous lines can work well and look stunning. On a practical note however, rectangular shapes tend to make more efficient use of space – an important factor in modern small gardens. One option to consider is having a rectangular patio set amongst flowing, curvy borders. The shape of the borders will soften the harsh lines, as will any plants which are allowed to spill over onto the patio. The decision you make here will probably have the biggest impact on the final appearance of your patio, so it can understandably seem a little daunting! Particularly so, given the vast array of materials to choose from nowadays. Gone are the days when the only choices were concrete paving, brick or very expensive natural stone; the introduction of relatively inexpensive imported sandstones and limestones (particularly those from India) means that there is now a huge and mind-boggling array of different materials and colours to choose from. Concrete, sandstone, limestone, slate, granite, travertine, as well as gravel brick, block, setts, … the list goes on! In addition, the natural stones can be plain hand cut, or tumbled, or sawn / honed. And they come in a variety of different colours. Indeed with Indian sandstone, there is a wide variety of shades and colours within each individual “colour”. And of course, the different materials are often mixed for optimum effect – gravel areas within paving for example, or a brick edging. Mind-boggling is not the word! Our paving photos blog post shows a few examples and ideas for starters. … to name just a few! This should help you form some general ideas in your head as to what you do/don’t like. Finally, we would then strongly recommend going to see some of the different types of paving actually laid in situ. Some garden centres and builders / stone merchants have display areas where the paving can be seen (both wet and dry), and as landscapers we often find it is helpful to take clients to see some of our previous work when they are deciding what paving they would like. This is usually more useful than simply supplying samples – it gives a feel for how the materials can work when incorporated into an overall scheme. It’s also particularly useful with materials like Indian sandstone, which has such wide colour variations. Phew… that’s a lot to consider! It can seem a daunting task, but it’s worth spending the time getting it right – a patio is not something you want to replace every five minutes. 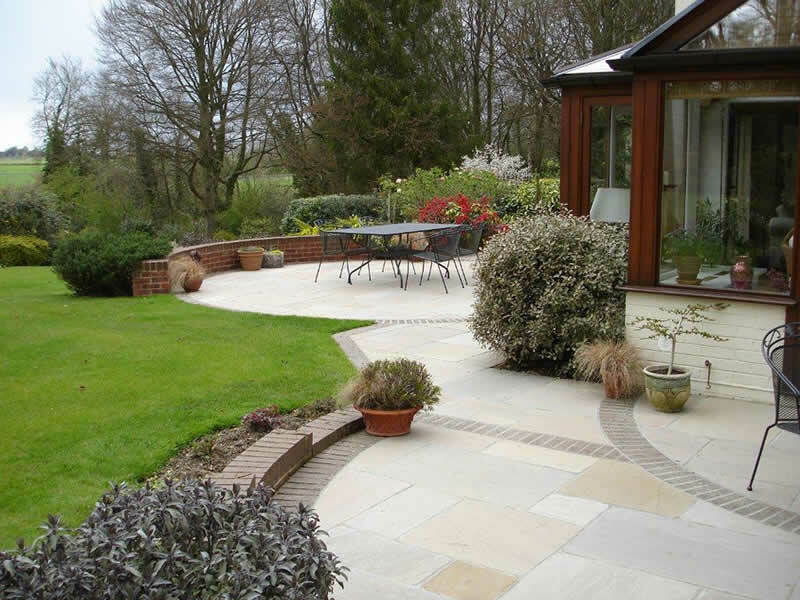 If you need a hand making the right decisions, or want to talk to us about incorporating a patio into an overall garden design, please get in touch – call us on 0118 934 2958. And don’t forget to have a look at our paving photos blog post for some inspiration too. we are in Tilehurst Reading and have an extension being built soon. Need professional advice re the patio. Do you offer a design service? Yes – garden design is very much at the heart of what we do. Please do give us a call if you’d like more information – 0118 934 2958. I have a relatively small garden, 9.5m x 7.5m, and want to preserve as much grass as possible for children to play on, but also want a patio with enough room for a table to sit 4, which can be extended (potentially onto the lawn) when we have family/friends round. What size patio would you recommend? I note you suggest 3x3m but could we go even smaller? Try measuring out your proposed patio size on the lawn, putting something around the edges to mark it – and then see how well your patio furniture fits. Don’t forget that people need to be able to get up and down, and in and out of their seats – so check for this as well as the space you have when everyone is seated. As we say in this article, if you are planning to extend onto the lawn, make sure you keep the level of the patio flush with the lawn where the two join. I hope that helps!